We live in an age of glamorous marketing strategies and exorbitant brand consumption. The clothes we wear, the gadgets we purchase, even the schools we send our children to- everything is glossed over with the sheen of consumerism. We want what sells. When it comes to our beauty needs, it is the same story. High-end cosmetic brands are all the rage. The irony is that consumers spend thousands purchasing beauty products that boast natural ingredients, while completely ignoring the natural products themselves. What we yearn for is often right in our kitchens, and we can reap the benefits without busting our bank balance. Fruits contain numerous beauty benefits. One of the most celebrated is the banana. The fruit, not to mention its peel, boasts numerous beauty benefits. From glowing, hydrated and younger-looking skin to luscious locks and healthier nails, a banana or two might just be the makeover you’ve been waiting for! 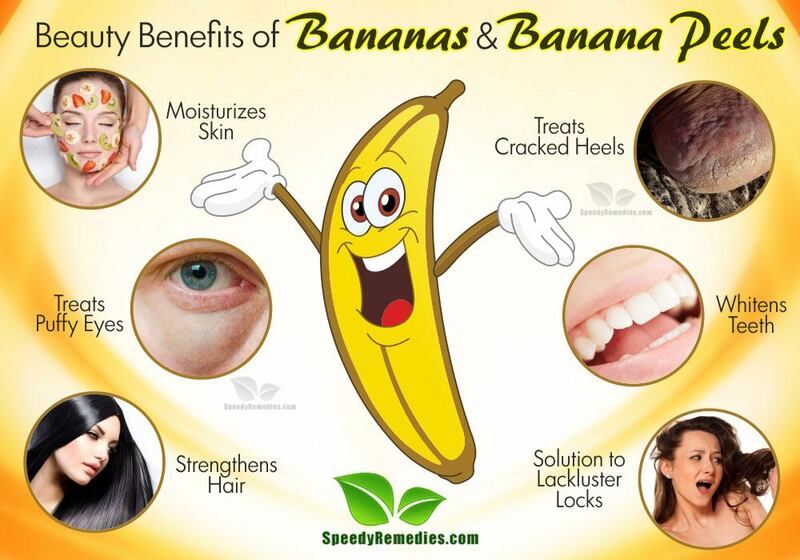 Here are some of the beauty benefits of bananas and banana peels. Does your skin feel flaky and rough? Does your moisturizer leave your face so oily you could fry an egg on it? A good ol’ banana is the answer to your woes. Rich in potassium and vitamin B, a banana face pack can do wonders for your irritated skin, leaving it soft and supple. Mash a banana in a bowl. Apply it on your face and leave it on for 15 to 20 minutes. Splash some cold water on your face to close the pores as well as retain the moisture, then pat dry. Use this face mask daily. Bananas may well be known as the ultimate skin-protector, owing to their vitamin E content that boosts the skin’s ability to combat harmful ultraviolet (UV) rays, fights against free radical damage and reduces wrinkles. The vitamin A in bananas also considerably helps reduce blemishes and spots. Mix in 1 teaspoon each of honey and lemon juice. Apply the mask on the blemish-ridden areas of your face. While honey contains properties that kill pimple-causing bacteria and brightens skin-tone, citric-laden lemon juice fixes discoloration and reduces spots. Cut banana peels into strips and rub the inside of the peels on the affected areas in a circular motion. Do this 3 or 4 times daily. Banana peels have antioxidants, potassium and vitamin C that will work their magic to stop itching and inflammation as well as make spots disappear. While nothing substitutes for a healthy lifestyle and copious amounts of sunscreen to combat weather-beaten, old, wrinkly skin, a natural facial mask every now and then builds on the benefits of these primary, skin-protecting practices and helps maintain the skin’s elasticity. A banana mask has high levels of vitamins, antioxidants and minerals. The vitamins A, B, E and F (essential fatty acids) in bananas, along with the zinc, iron, potassium, magnesium and iodine, work wonders on delicate facial skin. It protects against free radicals that damage the skin and trigger premature aging. Mix 1 ripe banana with 1 tablespoon each of organic honey and oat flour. Add 2 tablespoons of fresh cream and mix well. If the consistency appears too thick, add a little water. Apply the mask on your face and leave it on for 30 minutes. Wash it off and pat dry. Use this mask 3 times a week to achieve younger-looking skin. As it does for the skin, the minerals and vitamins found in bananas also help the hair regain its sheen, gloss and moisture. In addition, it can help soothe an itchy scalp and provide comfort and nourishment to the hair roots. The high water content in bananas makes it the ultimate hydrator. The potassium strengthens the roots of the hair and repairs damage by maintaining the elasticity and reducing breakage. Furthermore, the vitamins, zinc and iron battle frizz. Cut a ripe banana into pieces and put them in a blender. Add 2 tablespoons each of coconut milk, olive oil and honey. Blend the contents until no chunks remain. Apply the mask on your hair and leave it on for 30 to 40 minutes. Rinse it out with lukewarm water. We have all heard of the miraculous conditioning properties of bananas, but seldom do we hear about their ability to add shine to dull and lifeless hair. This wonder-fruit never ceases to surprise with its abundance of benefits and natural attributes. Put 1 banana, 1 egg white and ¼ cup of olive oil in a blender. Blend the contents to make a paste. Apply the paste on your hair and leave it on for 15 minutes. Wash it out with a mild shampoo and apply a conditioner for stunning results. One could argue that, for many people, beautiful feet are next in line to a beautiful face. While feet were once neglected when it came to beauty treatments, foot-care procedures have become increasingly popular. Many of us are doomed with cracked heels, which come fast but go slowly! However, the pulp of 2 to 3 bananas, when applied to cracked soles, helps heal them quickly and deeply. So pulp your way to softer heels today and forget about wasting thousands in the beauty parlor! Not only the fruit, but even its peel, has innumerable benefits for the skin and eyes. There are white fibers on the inside of a banana peel that are known to reduce eye-puffiness, and the potassium content in the banana fruit helps eliminate extraneous salt in the body that causes fluid retention and, consequently, puffiness. Scrape off the fibers from the banana peel. Mix them with some aloe-vera gel. Apply the mixture all around your eyes and leave it on for 10 to 15 minutes. It sure looks like the mighty fruit caters to the beauty needs of every inch of the body! Instead of buying expensive teeth-whitening products, simply cut off a tiny piece of a banana peel and rub it against your teeth twice daily to make your teeth shine brighter and whiter in a few days’ time!